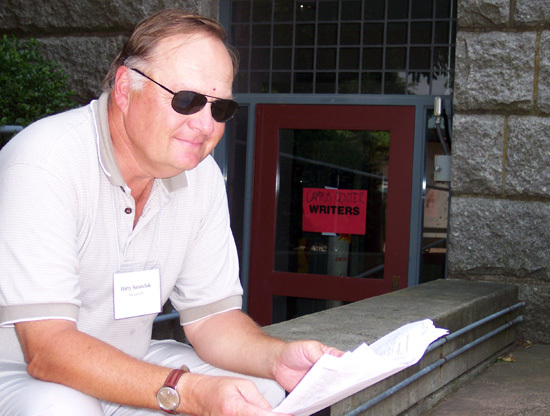 Harry Saranchak, a Wesleyan Writers Conference participant, reviews his writing outside the Davenport Campus Center June 19. The conference is one of 31 campus programs occurring this summer at Wesleyan. Learning never ceases at Wesleyan, even in the summer. The Cardinal Hoop Clinic. The Russian Intensive Program. The Health Professions Partnership Initiative. These are just a few of 31 on campus programs running during the summer months. The programs are not just for college-aged students, either. Many are specifically designed for younger children and adults. The programs actually began this year before the class of 2006 attended commencement May 18 with the Russian Intensive Program. May closed with the opening of the Hughes Summer Research Program. Junes highlights included 50th edition of The Wesleyan Writers Conference and the beginning of the six-week-long Upward Bound program, which is designed to prepare selected students academically and socially for the upcoming school year. In addition to academics, students participate in activities addressing the issues which affect today’s teens: AIDS, teen pregnancy, drugs and alcohol. From June 26-August 11, Wesleyans Project to Increase Mastery of Mathematics and Science (PIMMS) holds nine day-long summer institutes for area teachers. Teachers can take workshops on problem solving; using math games and activities to teach estimation; helping students master fractions, ratios, proportions and percents; and using technology in the classroom. The Health Professions Partnership Initiative (HPPI) began June 26 and ends August 4. Through this program, minorities who recently graduated high school can explore health professions. At Wesleyan, the students have the option to study anatomy, biochemistry, biology, biophysics, biotechnology, chemistry, pre dentistry, dentistry, epidemiology, biomedical engineering, genetics, pre-medicine, nursing, nutrition, pathology, pre-pharmacology, pharmacology, psychology, public health, science and biostatistics. Several programs focus on athletics. The Cardinal Softball Camp, Summertime Sports Soccer Academy, Select Soccer Academy, Adult Baseball Clinic, Cardinal Field Hockey Camp, Fundamental Basketball Camps, The Lacrosse Schools, the East Coast Soccer Academy, the Total Volleyball Camp, and Tennis Camp all begin in July. Wesleyan coaches create the curriculum and teach at many of these camps, and Wesleyan student-athletes are often employed as instructors. Summer activities round out Aug. 25 with International Student Orientation and New Student Orientation on Aug. 29.